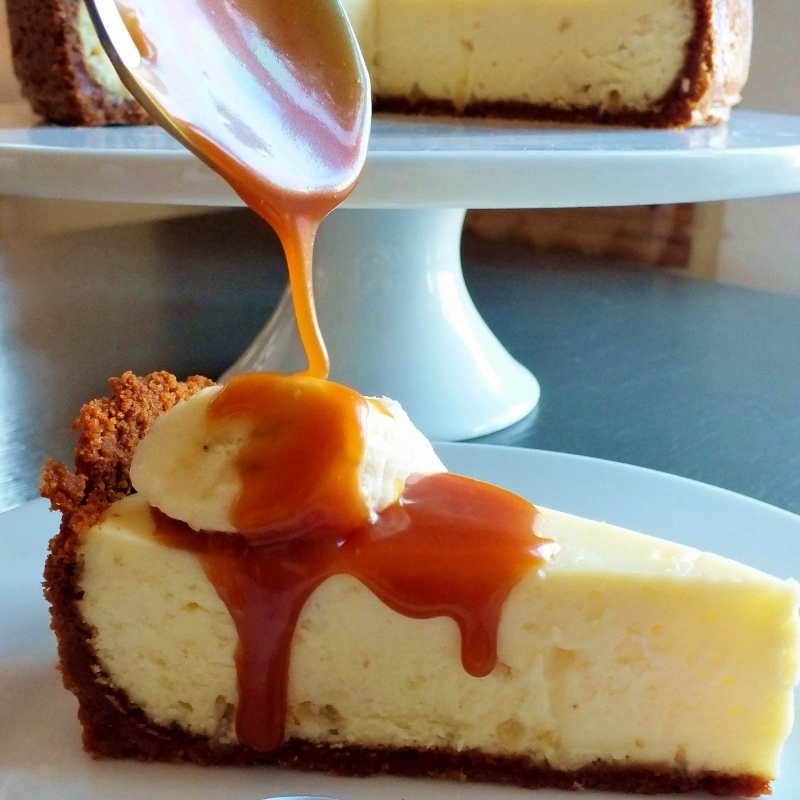 Initially I thought that topping this cheesecake with candied crystallized ginger would be appropriate, but it turns out that bananas work much better with both the caramel and the cheesecake. One substitute I did make from the original recipe, however, was to use Anna’s ginger thins instead of digestive biscuits, simply because I have never seen digestive biscuits in Seattle grocery stores I go to, and also heard that Anna’s cookies work really well for cheesecake crusts, in particular the ginger thins. You will need to begin this recipe one day ahead. Preheat the oven to 150°C and lightly grease a 24 cm springform cake tin. 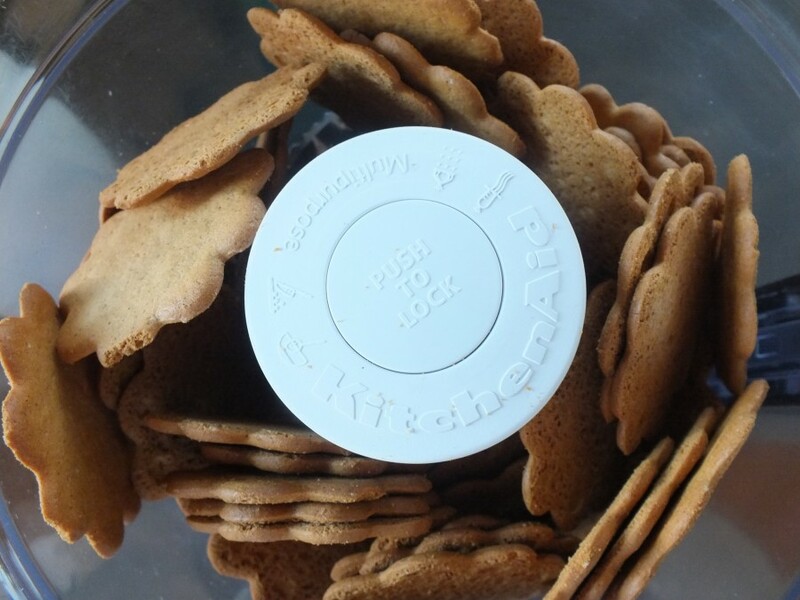 Place the digestive biscuits in a food processor and blitz to fine crumbs. Add the sugar and melted butter and pulse briefly to combine. Tip the mixture into the cake tin and press it into the base firmly and evenly. Melt the white chocolate in a bowl set over a saucepan of simmering water. 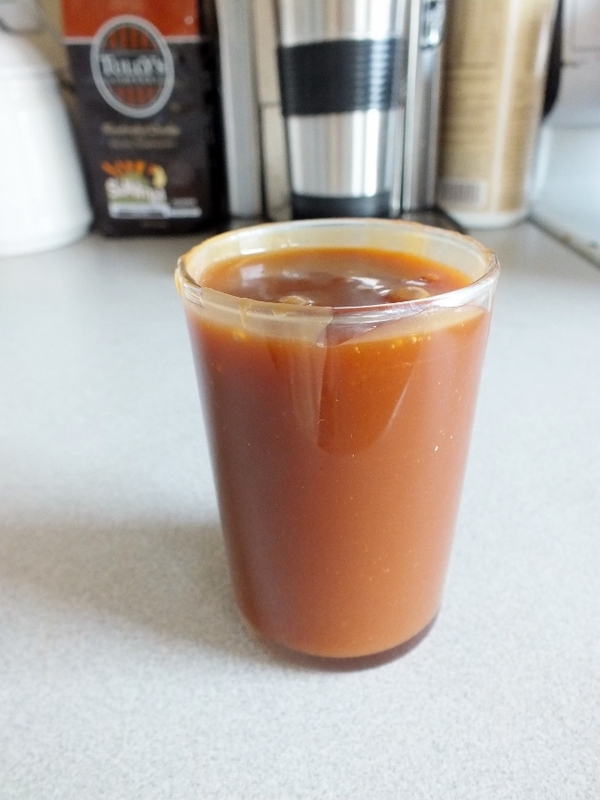 When completely melted, remove from the heat and leave to cool slightly. Beat the cream cheese in a mixing bowl to loosen it, then gradually beat in the sour cream, sugar and eggs. Lastly stir in the melted chocolate and the chopped ginger. Pour the mixture into the cake tin and bake in the oven for 30 minutes until barely set. Turn off the oven and leave the cheesecake inside until completely cool. Remove from the oven and refrigerate for at least 6 hours, or preferably overnight. To make the caramel, combine the sugar and water in a saucepan, add the lemon juice and stir to mix and make sure that all the sugar is dissolved. Bring to a boil over medium-high heat and cook undisturbed until the sugar starts to turn color around the edges. Gently swirl the pot to even out the color, until it reaches a medium light amber color. Remove from the heat source. From arm’s length, slowly add the cream. The mixture will bubble and steam. Be very careful not to expose your fingers and hand to the steam, using a whisk to mix in the cream until the caramel is smooth. Stir in vanilla extract when bubbles subside. 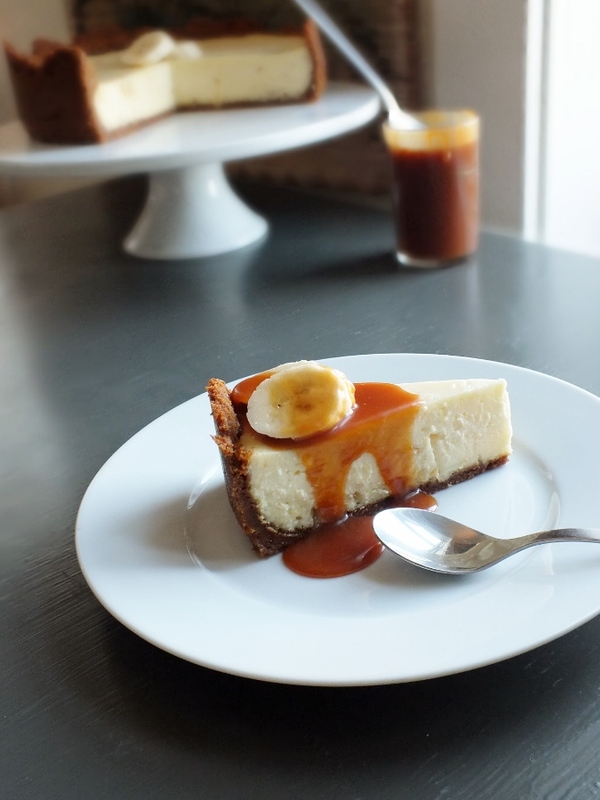 Serve the cheesecake drizzled with caramel sauce and topped with a few slices of banana. This entry was posted in baked goods, baking, cakes, cheesecake, dessert and tagged bananas, caramel, cheesecake, ginger, ginger cheesecake, sour cream. Bookmark the permalink. 🙂 I think ginger will always be one of my favorite; it goes so well with other things, from savory to sweet. Oh, that looks amazing! 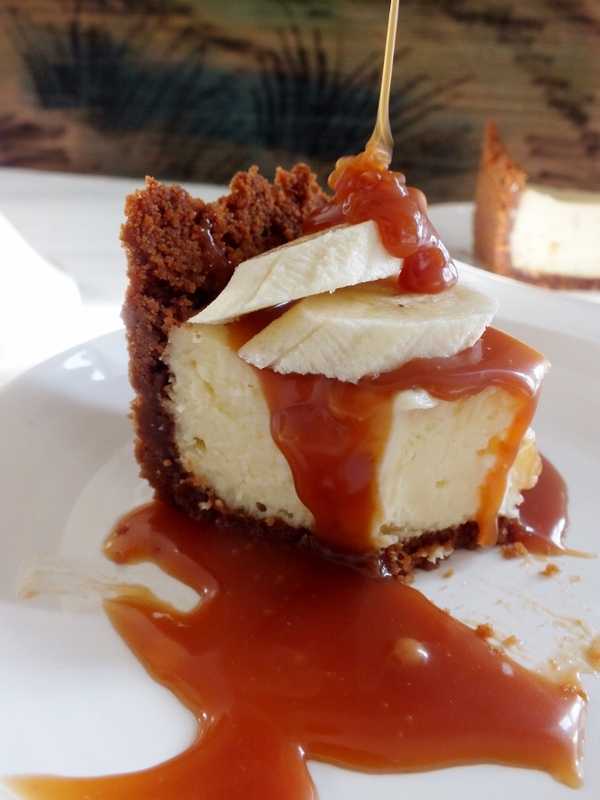 Love cheesecake, love ginger, love caramel and love bananas. This dessert has my name all over it! Cheesecake is my favourite dessert. And I can honestly say that yours look absolutely scrumptious! Aw, thanks! You’re too generous. I just am really enjoying this process of making things, and trying to show them in the best possible way. Have a good day! Well you are doing brilliantly in both things 🙂 you too! This reminds me of a cheese cake I made many months ago but never had time to post. One of these fine days, it shall be posted. I got the recipe from woman’s own or one of those magazines. I love the way yours turned out. 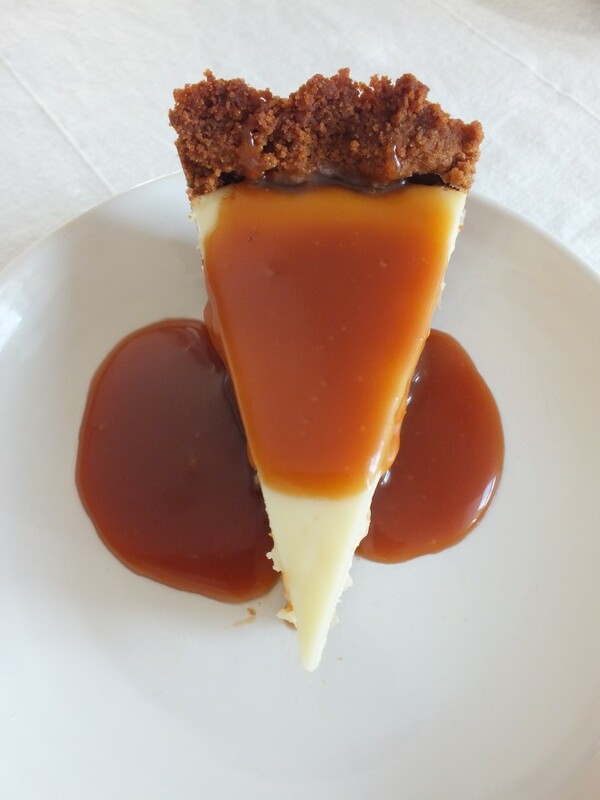 Makes me long for a cheesecake! Then, my goal has been accomplished! Thanks, Liz!